Atlantic City is growing and changing with the opening of the new upscale Borgata and the promise of more to come. The city is already firmly established as a gambling and convention destination and will only continue to grow. The Boardwalk, the ocean and the beach are part of the city's history and they are still there, but it's the casinos that draw the crowds these days. 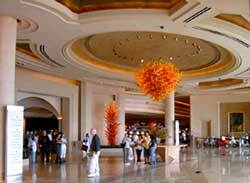 We visited on Labor Day weekend, 2003, just six weeks after the Borgata opened to see if it lived up to its promise of being "something different". It does. The interior is not Las Vegas and it certainly isn't themed to the point of fostering a circus atmosphere. It is elegant, mediterranean, restrained and relaxed at the same time. In the entrance of the casino and throughout the casino, glass sculptures that have the look of works by Dale Chihuly make a real statement. Service on the floor and in the restaurants is attentive and polite and everyone was very helpful. We ate at the Oyster Bar and the Buffet and would rate the food as good. Prices were on a par with Philadelphia restaurants, but high according to Las Vegas casino standards. We played craps, poker and blackjack in the casino and liked the atmosphere a lot. Cocktail waitress were attentive and you can order free drinks from anywhere in the casino, even if you aren't playing. The table stakes are generally high. Blackjack for instance, the mininum bet on Saturday afternoon was $15 if you could get a seat at those three or four tables. Most tables were $25 minimum bet and they went to $50 minimums in the evening. On Sunday, there were no $15 table to be seen. That is one of my major complaints about gaming in Atlantic City. Unlike Las Vegas where I've spent hours playing at $2 and $5 blackjack tables in many of the casinos, Atlantic City seems more intent on higher stakes games which makes gambling a more expensive, and serious proposition. Las Vegas is just more fun, but then it's not a weekend getaway that's just two hours from New York and Washington D. C. and less than one hour from Philadelphia via the Atlantic City Expressway. When to Visit: You can gamble anytime but in the summer and fall you get the benefit of good weather and can actual enjoy the beach, golfing and seeing the sights. Let's face it... Atlantic City is for gambling. The restaurants in Atlantic City are fighting the good fight against the casinos. We don't make any recommendations since, like everyone else who goes to AC to gamble, we usually eat at one of the casino restaurants.